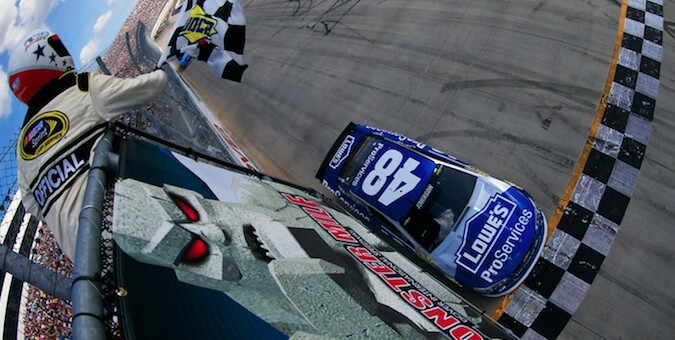 Jimmie Johnson earned his 10th ever victory at Dover International Speedway Sunday afternoon, jetting into the lead on a green-white checker restart and holding off his determined Hendrick Motorsports teammate Kasey Kahne for the win. The result makes Johnson the fifth driver in Sprint Cup Series history with 10 or more wins at a single track. The race at Dover started off with the longest green flag period of 2015, running 73 laps caution-free. Pole sitter Denny Hamlin led the field for 41 laps before being passed by Martin Truex Jr. Truex would go-on to lead a race-high 131 laps, while current points leader Kevin Harvick led the pack for 91 laps. In total, the race saw nine different leaders throughout its 400-lap duration. Johnson may have had a bit more difficulty working his way through to the front of the field if fierce competitors like Kyle Busch and Denny Hamlin weren’t wrecked earlier in the day. Hamlin was pushed into the wall by Clint Bowyer and Busch hit the wall trying to avoid him. Later in the race with just 30 laps to go, Busch wrecked with Brian Scott, putting an end to his second race back since suffering injuries in an Xfinity series race earlier this year. With Harvick leading, Johnson began to make his bid for the win. He began cutting into his lead with 28 laps to go and was out front when Casey Mears wrecked with 3 laps left. Johnson held off Harvick on the restart for the win, with Harvick finishing second and Kyle Larson finishing third. Kasey Kahne and Aric Almirola rounded out the top five. Jeff Gordon secured his 10th top ten finish of the season, while Dale Earnhardt Jr., who was given a late-race penalty for speeding on pit lane, finished 14th. Danica Patrick was 15th, while Tony Stewart continued his string of bad luck with a 16th place result. NASCAR heads to Pocono next for the Axalta ‘We Paint Winners’ 400 on June 7. Harvick currently sits atop the points standings, with Truex Jr. and Johnson in second and third, respectively.